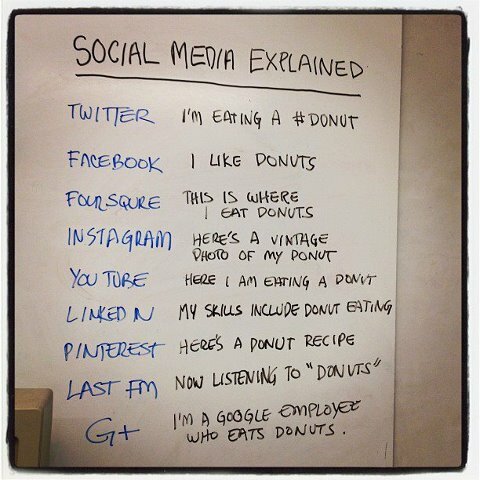 I recently came across this photograph that basically put social media in simple terms. As everyone should know, social media is a way for you to connect to people online. So, I wanted to share my thoughts about some of the social media sites I use everyday and how they help me. I use Facebook to interact with my friends about my personal life. I like to see what my friends are doing in their lives as well, it keeps me up to date especially if I don’t see people on a regular basis. Facebook also allows me to promote interests of mine such as these blog posts I write. I am able to share my writing with friends and they support me by reading what I have written. I have also started using Facebook for business purposes. I manage pages for organizations and businesses which helps me perfect my social media marketing skills, which can be put on my resume and LinkedIn profile. Twitter is a place for me to see what people are doing in the field I am interested in. On twitter, I can follow Richard Branson and see what updates he has about business. I essentially use twitter for educational and business purposes. I like to follow people who are influential in business and can offer valuable advice to young business people like myself. I can connect with people that I would have otherwise not been able to connect with by other means. This is my online resume. I update my profile constantly on LinkedIn. It is used to show people the type of experience I have and what activities I have been involved in. I am able to showcase my articles on LinkedIn in the profile updates, look for jobs, network, and maybe even offer jobs to people I know (in the future of course). Foursquare is something I recently got into and it’s actually pretty interesting. I can link it to my Facebook and Twitter accounts when I check-in somewhere. Personally, I want to see what my friends are recommending because I like to go to new places and experience new things. If my friends say they like it, then I might like it. As for business, I want to check to see how my clients are doing in terms of customers checking-in and what they are saying about the business. This helps us get a sense of what is most popular in the store and what we should focus on when it comes to discounts. I am also new to Instagram and it is actually really fun. I like to use my creative side when taking pictures and manipulating them into some artsy way. I like to see what my friends are up to and I am excited to learn more about this outlet of social media. All outlets of social media are connected. You can post something on Instagram that you can link to Facebook and Twitter as well. When you post to Twitter you can link to Facebook or LinkedIn. There is just so much you can do with social media and it’s fun to interact with a variety of people whether it be school friends, family, professors, co-workers, or even someone who wrote a best selling book. I am not saying everyone has to use every single type of social media tool, but it’s good to think of them as a way to enhance your personal and professional life. i personally use Facebook a lot compare to other social networks. and yes, i use Facebook same as you; to contact with my friends, to see what my friends are up to; on Facebook i am able share what i like, my wordpress blog, my interests and etc. same as my friends. so, generally it just keeps me up to date with my friends activities. and lately i started to use Google+ too. i like it, but i don’t have that number of friends which i have on Facebook. so, Google+ is like your Twitter account. i follow people, pages … in the interest of mine.